SaveMass is a browser add-on which can alter the performance of your browsers. 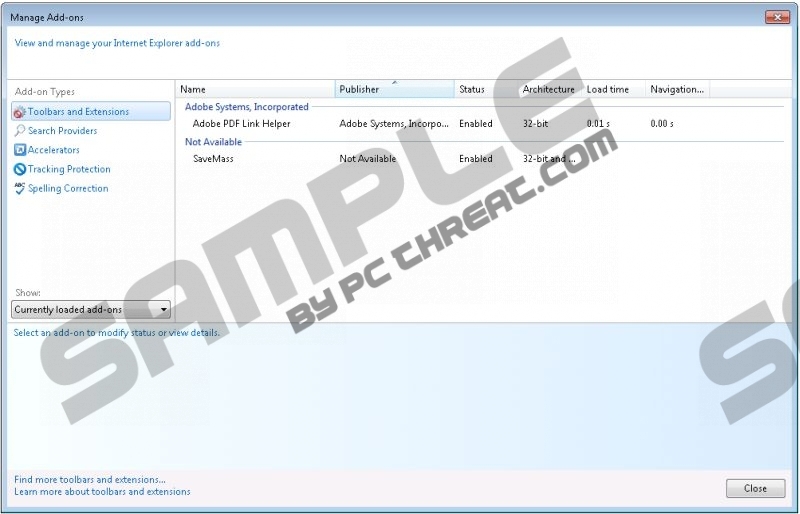 This browser add-on is compatible with Internet Explorer, Google Chrome, and Mozilla Firefox. The program is accessible at savemassit.info and could be bundled with a range of different programs, including other browser plug-ins, media players, and system optimization programs. The program was published by Cyber C.S.G. Soft Ltd and is now considered adware for it displays multiple third-party advertisements. SaveMass is aimed at online shoppers and was created to help them take advantage of online shopping. You should bear in mind that SaveMass is not liable for the advertisements displayed on your screen, which means that you click on SaveMass ads, including coupons, and web banners, at your own risk. The privacy policies of the websites advertised are not under control of SaveMass, and it is worth reviewing the information available on the website before downloading software or providing you personally identifiable information. In order to provide you with special offers and other advertisements, SaveMass monitors your online behavior. It records your clicks, impressions, browsing history, browser settings, and other information that could be used to produce new advertisements or enhance the quality of the service. It is important to mention that by installing SaveMass on your computer, you enable the program to access your data on *amazon.com and api.savings.com. The browser plug-in may records some information related to your identity. Moreover, any piece of information gathered by SaveMass may be shared with third-parties. If you want to be secure on the Internet, you should ignore SaveMass ads and remove the adware program from the browsers. Adware programs such as SaveMass do not endorse their sponsors by displaying their ads, which means that unreliable websites may also be displayed. By interacting with all those suspect pop-ups, you risk your privacy. Adware programs are one of the means to promote phishing websites, and you should keep away from them as much as possible. When it comes to removal, we recommend using SpyHunter because this security program can easily eliminate the adware program and take care of your online privacy. If your computer is not protected against malware and spyware, it is not enough to uninstall SaveMass, which you can do using our below-given removal instructions. Implement the recommended security program as soon as you can so that you can browse the Internet safely. Remove the SaveMass adware program. Quick & tested solution for SaveMass removal.